Mattatall has worked with many organizations and businesses over the years. Read below to see how Mattatall can help your company see the success it deserves. When it comes to Critical Information Systems, InterTalk was the pioneer. Their business started in 1997 as a systems integrator for radio communication and has grown over the past 20 years to become what it is today – a leader in mission-critical communications across many different industries. Santé Centre is a brand new, wellness focused building located at 50 Gary Martin Dr. in Bedford. Dr. Cindy Toner and husband Dr. Jason Plotsky have had this vision for some time and as of Summer 2016, their planning paid off and Santé Centre opened its doors! Expanded floor space, options at every budget level, a full tasting room, a broad selection of wine with an offering of beers and spirits too. This truly is a new concept store. The Port by the NSLC is a step forward in every way from its predecessor on Doyle St. While the dedicated and knowledgeable employees remain the same, they will now operate out of a brand new 8,300 square foot retail store at the corner of Clyde and Birmingham Streets in downtown Halifax. You know what is awesome? Pizza. It’s good hot, it’s good cold…it’s good at night and it’s good at the morning. Because it’s so good, there are a multitude of pizza providers and options for when the craving hits. 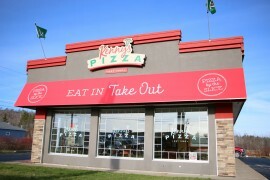 Kenny’s Pizza first opened it’s doors in Cape Breton in 1989 and have since grown to 11 locations throughout the province. Downtown Halifax has never had a shortage of watering holes, but with an evolving and expanding city comes different and more refined tastes. 2 Crows Brewing Co. is a microbrewery and tap house on Brunswick St, and they are bringing an absolutely fantastic product to market. Lawtons Drugs has been a go-to drug store for Atlantic Canadians for over 100 years. During this time they’ve evolved from a pharmacy alone to a one-stop-shop for many consumer products. 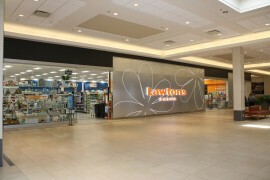 Whether your needs are health, beauty, giftware, or just a few snacks to watch the game, Lawtons has always been there. Nova Truck Centres have been selling and servicing commercial trucks for over 40 years. Whether you need a new truck or trailer, parts or service – they’re your one stop shop. Recently, they moved from two adjacent buildings on Thornhill Dr. to a brand new 40,000 sq. ft. facility on Wilkinson Ave. When you are Atlantic Canada’s source for fun, you want to make sure your brand new 27,000 sq. ft. location reflects that! Pro Cycle has been an industry leader in motorsports for over 30 years and they recently made a move from their long-time home on Windmill Rd. to Higney Ave. in the new part of Burnside. When it comes to restaurants, people don't just want good food - they want an experience. The Bertossi Group provides that and more at their four restaurants, La Frasca, Ristorante A Mano, The Bicycle Thief and Il Mercato. When we think of bowling, one word comes to mind – FUN! Fun for all ages, all budgets and all occasions. When Bowlarama came to us to help redesign the interior of their Spryfield location they wanted something…fun, and boy did they get it. The Lunenburg County Lifestyle Centre is a brand new $34 million dollar sport, recreation and community facility located in Bridgewater, NS. The LCLC boasts an NHL-size arena, an aquatic centre with a therapeutic pool, a public library and various other multi-purpose spaces so it would naturally need some signs that show you how to get around in such a large and varied space. Choosing the appropriate beverage is a very important decision. When you’re searching for your drink of choice at the Nova Scotia Liquor Corporation, you need to be able to do so efficiently and with ease. With so many options for locations to fuel up, whether it be for your car or yourself, Fast Fuel and Needs Convenience provide a one stop shop. So it makes sense that they would depend on a sign shop that can provide for all of their needs in one convenient place. We love doing work in our own hood. When we got the opportunity to completely overhaul the signage in Burnside Industrial Park - we were ecstatic.